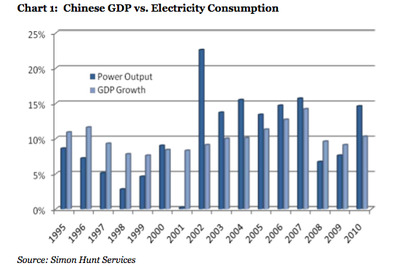 Earlier this year, before everyone became focused on EM inflation and revolution in the Mideast, one of the big perceived risks to the market was the prospect of a Chinese slowdown, and whether diminished demand would have ripple effects in Europe, the US, Brazil, Australia, and of course in the markets of various commodities. In its latest letter to investors, Absolute Returns Partners argue that already began dramatically in 2010. The gist: It’s well known that Chinese GDP is basically a made up figure, and that other measures like electricity usage is much more honest. And when you look there, you see the problem. 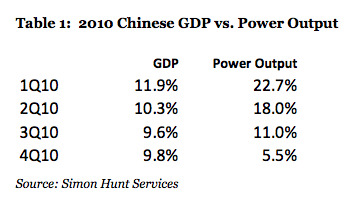 (2002-07 and 2010), GDP growth is lower than the power output. Digging one level deeper reveals something rather more serious. offending their new pay masters.